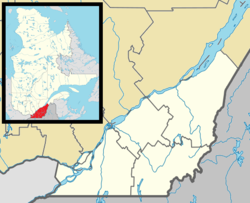 Montmagny (French pronunciation: ​[mɔ̃maɲi]) is a city in the Montmagny Regional County Municipality within the Chaudière-Appalaches region of Quebec. It is the county seat. Its population as of the Canada 2011 Census was 11,491. The city is located on the south shore of the Saint Lawrence River east of Quebec City and was founded more than 350 years ago. It is Canada's Snow Goose Capital. Festivals include the International Accordion Festival in September and the Festival of the Snow Geese in October. The city was named after Charles Jacques Huault de Montmagny, the first governor of New France. Samuel de Champlain was commander in chief. 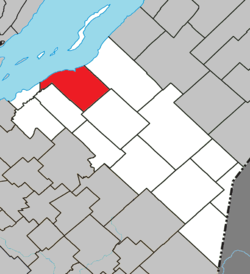 Montmagny was the county seat of the historic county of Montmagny County. Montmagny is north west of Notre-Dame mountains which is the official -but not most commonly used- designation of the Canadian extension of the Green Mountains as they are called in New England. While Monts Notre Dame is the official name, the vast majority of people living in the area stretching between Quebec City and the Gaspe peninsula refer to them as simply "the Appalachians" (French: les Appalaches) which is the origin of the official designation of the region comprising Quebec City's South Shore suburbia extending to the US border to the east and northeast, known as Chaudière-Appalaches after the mountains and the main river flowing down from them into the St. Lawrence. The city of Montmagny itself is parted by the South River (French: Rivière du Sud), where a smaller river named Bras-Saint-Nicolas merges into it. The confluence of waters swells into a set of falls leading to discharge into the Saint-Lawrence a short distance west of the city. Montmagny is the seat of the judicial district of Montmagny. The industrial sector is the backbone of the economy. However, the city lost many jobs when Whirlpool closed its activities on May 13, 2004, incurring the loss of 600 jobs. The city has rebounded from that period. Textile industry has also made employment for decades. A post-secondary institution, The Centre d'études collégiales de Montmagny, a hospital, named Hôtel-Dieu de Montmagny, and a provincial jail are part of the economy. ^ a b "(Code 2418050) Census Profile". 2011 census. Statistics Canada. 2012. 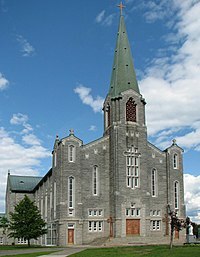 Wikimedia Commons has media related to Montmagny, Quebec.